Well - there you have it. The dust has settled on the first episode of James Corden and Mat Baynton’s new comedy The Wrong Mans (sorry, I can’t do the ‘s’ in smaller type) and I’m still trying to soak it all up. Talk about a rollercoaster opener! Baynton heads the cast as Sam, a drippy, social outcast of a council pen-pusher whose sole responsibility at work is to come up with a new slogan for their town. He’s had plenty of time, but all he can come up with (when pressed) is ‘Bracknell is dead. Long live Bracknell’. This, and persistent lateness doesn’t exactly endear him to his colleagues - who appear to be the most miserable bunch of swines ever to occupy a single office space. In complete contrast is livewire post boy (I use the term loosely) Phil (Corden), a man so desperate for friends he’s prepared to give Sam the time of day, and eagerly points the rest of the staff in the direction of the notice board, where he’s trying to get them all to sign up for go-karting. Unfortunately, nobody’s interested. Except Sam who, in a Jerry Maguire moment, agrees to go. For him, it’s merely the continuation of the morning from hell, waking up after a wild night on the booze - during which he left umpteeen mobile messages for his ex-girlfriend (who also happens to be his boss), having his bike stolen and - rather more divertingly - witnessing a car crash. In the aftermath of the last event, he finds and answers a ringing mobile phone - only to hear on the other end that someone who sounds like they mean business, is planning to kill his (Sam’s) wife, if he’s ‘not there by 5pm’. Sam is aghast, and still in a state of shock as he gets to work, hence the crap slogan and rashly agreeing to karting, but his life takes a turn for the surreal when Phil overhears a mobile phone message from the mysterious villains, and promptly insists this is “their moment”, claiming it’s down to the pair of them to save the virtual damsel in distress. This involves a hilarious trip to the hospital to find the phone’s true owner, sorting out a potentially disastrous medical mix-up and a chance for them both to ‘roll deep’. The Wrong Mans owes a great debt to the Coen brothers (who Corden and Baynton cite as inspiration), but there’s also a hefty amount of Ricky Gervais and The Office-style humour in here, too. 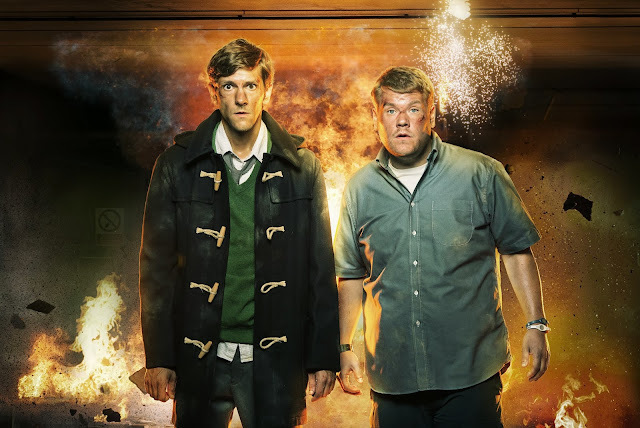 Baynton is a young man steam-rollered by life, and yearns for someone else to take control, but when Corden does just that, he’s pitched into a fast-paced, scary situation and he has absolutely no clue how it will end. Rather deliciously, neither do we. For all Phil’s bluster, he’s every bit as desperate to change his pitiful existence as Sam - though I suspect when things get tight, even he will admit going toe-to-toe with a bunch of violent kidnappers perhaps wasn’t the way he would have gone. As mentioned in the preview, there are some hefty names attached to this project, but it’s not because the material needs filling out with someone’s ego. It’s more likely because the likes of Dougray Scott, Nick Moran and Dawn French know top-quality work when they see it. I await future episodes with bated breath!